My name is Harry Blackburn and my passion is fly-fishing. I am 50 years young, a native Californian and I have been guiding in the Eastern Sierras for over 20 years. I have an extensive background coaching and guiding the ski slopes, streams and lakes of the Eastside of the Sierras. 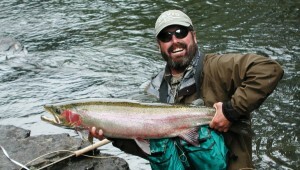 I started working as a guide in the late 1980’s for the Trout Fly, under the ownership of John Irons. Then I started The Eastside Guide Service with my good friends Tom April, Mike Peters and Kevin Petersen.I have worked for Mammoth Mountain Ski Area for 30 years. I was a ski instructor and now I coach and manage the Mammoth Mountain Junior Ski Team during the winter season. I have guided for the famed “Arcularius Ranch” on the Upper Owens River and for the “Hot Creek Ranch” on the gin clear waters of Hot Creek using only dry flies. I am available to guide the waters from Bridgeport to Bishop. I have fly-fished the crystal clear saltwater of the Bahamas, sight fished in the Yucatan for Bonefish, Tarpon, Permit and Snook and swung flies for Steelhead on the famed streams of the Pacific Northwest. I have pioneered & perfected fly-fishing methods on Crowley Lake, with Chironomids under an indicator. I enjoy tying my own flies and have a unique understanding of the life cycles of our local insects. Whether you are a beginner to the art of casting a fly rod and catching fish on the fly or a seasoned veteran, I have the ability to make your fly-fishing adventure successful. Mammoth Fly Fishing Adventures Facebook!